9 August 2016, at 12:00a.m. 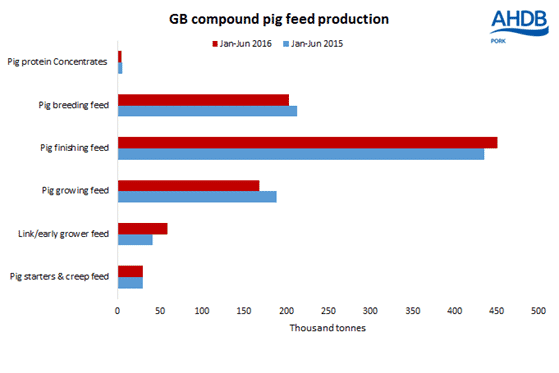 UK - Total GB compound pig feed production for the first half of 2016 totalled 916,000 tonnes, a slight increase (0.4 per cent) on the same point in 2015, according to latest data released by Defra. Breaking it down by feed type, grower feed production increased by 1 per cent to 230,000 tonnes and finishing feed production increased by 4 per cent to 451,000 tonnes, in the first half of 2016 compared to Jan-Jun 2015. However, pig breeding feed production decreased by 4 per cent to 203,500 tonnes over the same period. In terms of feed ingredients used in total GB animal feed production (compound and IPU), from January-June, 3 per cent more wheat and 2 per cent less barley was used compared to the previous six months at 2,323,700 tonnes and 511,200 tonnes respectively. For the majority of animal diets, wheat has a higher nutritional value to barley. The increased usage of wheat over barley could be attributed to the price relationship between the two feed ingredients. Since the start of March to the end of May, the discount of UK average ex-farm feed barley to UK average ex-farm feed wheat closed below £5/t, making wheat a more attractive feed ingredient. However, since the start of June, the price gap between the two cereals has widened once again (£14.50/t as at w/e 28 July). If this price relationship continues, going forward more barley may be used in animal feed production at the expense of wheat.